Heeft u een vraag voor Majesty Hotel? Gelegen in Kamaryut is Majesty Hotel de perfecte keuze voor reizigers die Yangon en omgeving willen bekijken. Gelegen op 5.6 km van het hart van de stad, bevindt dit 1-sterren hotel zich op een excellente locatie met de grootste attracties binnen handbereik. Dankzij de praktische locatie liggen alle belangrijke trekpleisters in de buurt van het hotel. De faciliteiten en diensten, geboden door het Majesty Hotel, garanderen een plezierig verblijf voor gasten. Maak in het hotel gebruik van een selectie topklasse faciliteiten, zoals gratis wi-fi in alle kamers, snel in- en uitchecken, bagageopslag, wi-fi in openbare ruimtes, parkeerservice. Aanvullend beschikken alle gastenkamers over een variëteit aan voorzieningen als plasma tv, internet (draadloos), draadloos internet (gratis), airconditioning, wekservice, om zelfs de meest veeleisende gast te tevreden te stellen. De recreatieve faciliteiten van het hotel, inclusief tuin, zijn ontworpen voor maximale ontspanning en onthaasting. Ontdek een boeiende mix van professionele dienstverlening en een breed scala aan faciliteiten in het Majesty Hotel. Het verblijf in dit hotel was een prima begin van onze 3-weken reis door Myanmar. Bijzonder vriendelijke ontvangst door de eigenaar mr. Nay, men stond steeds voor ons klaar bij al onze vragen. Zeer schoon, leuke restaurants in directe omgeving. Complimenten voor de goeder service van de vriendelijke eigenaar Mr. Nay en zijn medewerker Thet Hlaing Shein. Aanrader! Na een prettig verblijf bij aankomst in Yangon hebben we dit hotel ook geboekt voor de laatste twee dagen. De kamers zijn uitstekend en de medewerkers/eigenaars zijn zeer behulpzaam bij het organiseren van dagtrips! Wij verbleven hier met onze 3 jarige dochter. Dank voor een prettig verblijf, groet Niels, Linda en Vita. Hotel is a converted 3 storey house. Rooms furnished with simple wooden furniture. Cupboard are only chest height with few hangers. Toilet looks old and water pressure is poor. Having said the above, Majesty Hotel serves simple breakfast for guest. It is a 10mins walk from Hledan Centre and just across GMP shopping mall. It is only good for business travels. Hotel is old colonial style house that has been renovated nicely. Still has colonial feel - spiral staircase, balconies, high ceilings. Location was good since we had people to see in the University area. 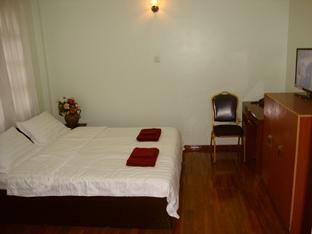 Staff were very helpful (calling taxi, helping with luggage, fixing dripping air con in the room, resetting Wi Fi router. Breakfast was mostly Burmese which we enjoyed. Wi Fi was stable for the most part. It was the best choice for a one day transit, with a one day city tour. We had very strange flight schedule, so we had to arrive and departure early and late, but the staff arranged us a taxi, and woke up to help taking out our luggage. Credit card payment is possible. I brought a printed map of the hotel on agoda, and showed it to the taxi driver because the hotel is not facing main street. The room was clean, not noisy at night. We found a restaurant for dinner near the hotel. I really loved the warm feeling that when you are staying at the Majesty Hotel, you really are in someone's home and you almost feel like part of the family. Grandma was trying to fatten me up the whole time (it worked), offering me extra toast and more omelette every morning and I loved having a giggle with the baby. The hard thing for this hotel I think is going to be that as Yangon's traffic deteriorates, its distance from town (which would only be 10mins without traffic, but once took me over an hour) is going to become more and more prohibitive. I would be back in a heartbeat if it was right in town and closer to the restaurants etc there. Still, it is conveniently close to Hledan Junction - so there are food places around - and is closer to the northern part of Inya Lake and the airport. I couldn't have asked for more. the owners are warm, educated and refined people who show genuine concern and warmth for their guests. It's a lovely looking boutique hotel in one of the more unique parts of Yangon - explore the neighborhood - it's delightful. Also very convenient for the airport. 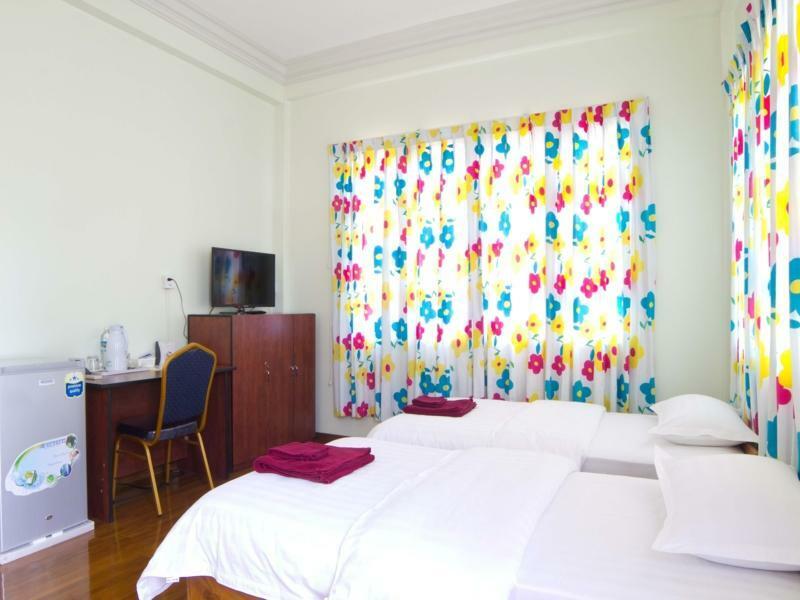 I liked the wide windows and quite a big room with reasonable price compared to other hotels in Yangon nowadays. Also the surroundings are quiet. But there's some inconvenient things; Not easy to find. It's inside the small road. The sign should be bigger. Some mechanical problems such as shower temperature, manually switched air conditioner. Close to the airport, friendly staffs, take-away breakfast. In general, the hotel is not worth the value considering the old and shabby rooms and the dark and badly equipped bathroom. But then the exceptional nice and friendly staffs make up for it, especially with the nicely packed takeaway breakfast that we requested for our early flight the next day, among other help they offered. The family that runs the Majesty is great. Genuinly friendly and helpful. Room was kind of dumpy. Super hard pillows. Worst thing was the shower, or lack thereof. If you want to shower, you have to sit in the tub and hold the shower wand. Very awkward. We were wondering why they just didn't put a wand support on the wall and provide a curtain. An easy fix. We were looking for an hotel not too far from the airport. Majesty hotel is at 1 hour from the airport during rush hour, 30mns in the early afternoon. The hotel is simple but clean. The breakfast could be better. The staff is very very nice. Careful in the bathroom, the hot water is playing with you: sometimes the water is very hot, then cold, then hot again. A little bit hard to find for the taxis. And no interesting restaurant around. 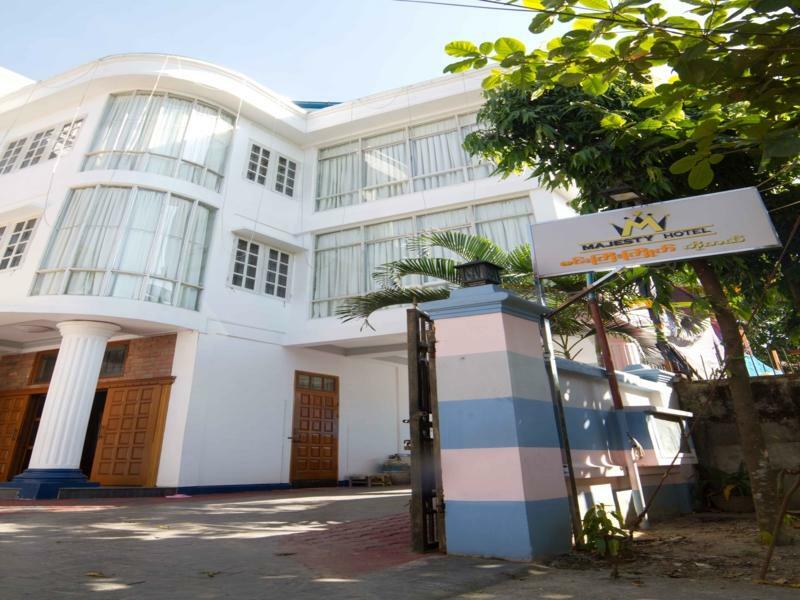 Anyway, if you are looking for an hotel near from the airport and just to stay for transit in Rangoon, this is a good choice. Hospitality and kindness of the owners, their wish to help with any issue, the tasty breakfast. We stayed 3 nights at this hotel, in July 2014. We were satisfied with our stay especially due to Nay (the owner) for his kindness and wish to help with every issue we had (irrelevant to the hotel and services). This is a small family business and it shows (the guests are treated as friends). Nay's mother prepares delicious breakfast which (though limited in variety) every day has a different local dish (e.g. mohinga or green tea leaves salad) which was the most delicious of all we tasted in Myanmar. Cleanliness of the room was above average (for Myanmar standards), although there were some plumbing problems with the bathroom. The location of the hotel, though not in the center, is an easy 2.5-3$ taxi drive from downtown (could be a little tricky for the driver to find the place). This hotel is in a great location. We stayed for 6 nights and the owners and staff were very helpful and accommodating. I would definitely recommend this hotel.